Keshet Cave is known as the most beautiful view in Israel with the highest point in the Western Galilee, with a vista that extends from the sparkling Mediterranean Sea to Akko, Haifa, Nahariya, the entire Galilee, and well into Lebanon. Once a real cave, the ceiling of the cave eroded away millennia in the past, leaving only an arch which gives the site its name. 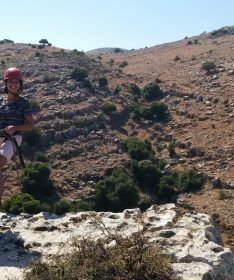 On this private tour you can rappel off the mammoth natural stone arch bridging the mountains, sailing through the air with an amazing panoramic view surrounding you. It’s a marvelous experience. We use cables to take the adventurous 25-minute beautiful hike back up – often accompanied by many curious mountain goats and Syrian hyrax. This is also a site that is excellent for groups with different levels of experience and fitness because all the extreme activities are optional. If you would like, we can add a Himalayan rope bridge to your Keshet Cave adventure. This Himalayan rope bridge is built by our expert team just for your group. It is strung from one side of the large gap to the other, and each person crosses the bridge, 100 feet in the air, holding on to the ropes!